March in Teton-Yellowstone country means variety, and I've lived it these past 10 days or so. 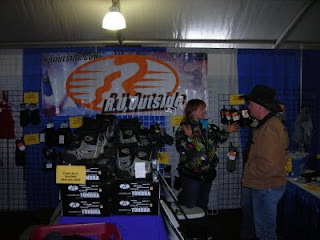 An annoying head cold slowed me down a bit, but I still managed to do the West Yellowstone Expo last week. For me, it involved working the R.U. 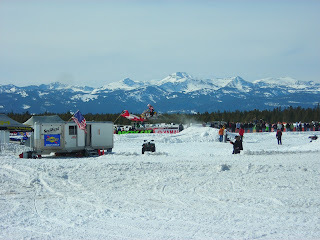 Outside booth, doing a nice ski on the Rendezvous Ski Trails, and watching a little snocross racing out at the old West Yellowstone airport (photo). We had good results at the Expo itself, once again in spite of the economy. 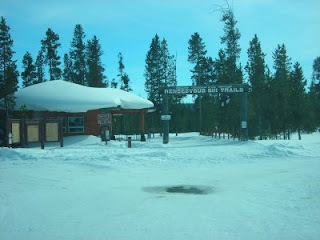 Snow conditions were good, and Yellowstone Park was still open for snowmobiling (albeit only with a guide and on their approved 4-stroke sleds), which helped. It was R.U. Outside's 18th year exhibiting at the event, and it always brings back a flood of feelings. In March of 1992, Joanne & I showed up just out of college, with a duffle bag full of our BackThing back supports and a small table...and now here we are. Countless friends and memories line the path, and I'll forever have a soft spot for West Yellowstone. As always, I took a break one afternoon during the Expo, and got out in the surrounding woods. It clears my head, gets the blood flowing, and is a nice mini-adventure in a beautiful area. West Yellowstone is well-known for its Rendezvous Ski Trails, but I had never experienced them before. It was impressive, challenging and fun. There's even a biathlon shooting range out there for the truly hard-core. 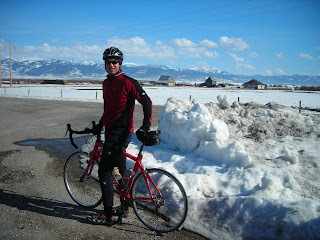 Back in Driggs, a late week warm up left a fair amount of pavement bare. I couldn't resist getting the bikes out and doing a Friday afternoon spin from town out to Horseshoe Canyon & back with Joanne. It felt great, and sent us into the weekend with high spirits. Today, of course, I awoke to a Monday morning blizzard. Spring variety.